Last week the Royal Australian Navy (RAN) Rugby team were on tour in Brisbane playing their Airforce and Army opponents at the Australian Services Rugby Carnival. Between training and matches, the players used Medi-Rent’s Rebound Sports Recovey System – a recovery system that uses sequential intermittent pneumatic compression (SIPC). 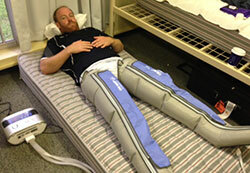 Players don the garments for 40 minutes after play and air is pumped through the system from the foot towards the groin at a pressure comfortable to the user. Dr Falconer (RAN) reported that, “Rebound Recovery was great to use on tight calves, acute ankle sprains and some players with shin splints”. SIPC has been proven to improve sports recovery by removing swelling and stiffness that occurs in limbs during exertion. A study published in the British Journal of Sports Medicine suggested that, SIPC provided a 45% improvement in the subjects’ ability to perform subsequent exercise after treatment. Another study has examined the recovery of the tibialis anterior muscle using SIPC and concluded that ‘treatment of fatigued muscle after a sustained effort improves its contractile capacity in comparison to passive recovery’ (Wiener et al, 2001). Bickel et al (2011) reviewed the effects of SIPC on the cardiovascular system. They found that there were ‘significant increases in cardiac output and stroke volume, as well as ejection fraction, the velocity-time integral of aortic flow, and fractional shortening of the left ventricle’. Find out more about Rebound Recovery here. If you’d like a copy of any of the above-mentioned studies contact us here.